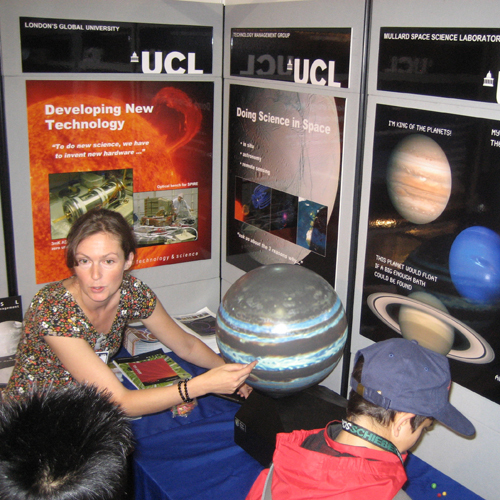 The Technology Management Group of the UCL Mullard Space Science Laboratory (MSSL) has completed another highly effective week at the Farnborough Airshow, promoting UCL and its programmes for teaching and working with industry, and reaching out to engage the public with science. Professor Alan Smith, Head of the UCL MSSL and Vice-Dean for Enterprise of UCL Mathematical & Physical Sciences, said: "Having a presence at well-attended trade and public events such as the Farnborough Airshow is not just extremely effective at raising awareness of UCL, but is useful in generating tangible new business leads for us." With more than 300,000 visitors, the airshow, which takes place every two years, is the world's largest temporary exhibition, with 3,600 tonnes of structures creating 90,000 square metres of exhibition space. Dr Steve Welch, Head of the Technology Management Group, said: "This event is very significant for us as it is gives us outstanding access to companies across the entire aviation supply chain and supporting industries - a very much wider spread of company types than one might imagine. We have developed an effective process for exploiting large events such as this: there's more to do than just being on a stand. This ensures that along with the general profile-raising that we hope for, we also come away with measurable outcomes." The event is a trade show from Monday to Friday, and at weekends is open to the public. The attendees on the weekend days - which are the busiest - still include trade visitors, but also members of the public. The UCL MSSL takes full advantage of this by adjusting the stand display. Dr Lucie Green says: "We have a strong commitment to sharing our research with the public, and this year our participation in the lunar missions was met with great enthusiasm."